The City of Moraine has a rich history from Johnny Appleseed to the Wright Brothers. Moraine Historical Markers have been erected throughout Moraine at sites honoring historical figures, buildings or businesses. Click here to download the Historical Marker Self Guided Tour and tour our City. The Pinnacles, formerly located just west of here, consisted of a gorge with unique large boulders created during the ice age on its slopes. The strange geologic rock formations (also known as the Devil’s Backbone) overlooked the Great Miami River. The updraft created by the terrain attracted soaring birds. From 1897 to 1899 the Wright Brothers biked here and observed buzzards (turkey vultures) soaring gracefully above the river valley. In the summer of 1899 the Wrights developed their wing warping theory while watching the birds at Pinnacle Hill twist the tips of their wings as they soared into the wind. In the 1820’s during a hike from Urbana to Cincinnati, John “Johnny Appleseed” Chapman planted a grove of apple trees just west of Dorf Drive in German Village. On September 23, 2010, honoring the 236th birthday of John Chapman, the City of Moraine rededicated a plaque and planted four second generation apple trees from seeds originally planted by Johnny Appleseed. The Ohio Electric Railway Company was an interurban system formed in 1907 and ran from Toledo to Cincinnati until 1927 providing efficient passenger service to scores of small towns in western Ohio between these major cities. In the early 1900’s most rural roads were unpaved and primarily traveled by horse drawn buggies and wagons. In wet weather and in winter, these roads were often impassable. In Moraine the OERC lines ran behind Ellery and Fulton Avenues. Construction began in 1835 and was completed in 1845 beginning in Toledo and ending in Cincinnati creating a water route from Lake Erie to the Ohio River. Boats up to 8 feet long were towed along the canal by using donkeys, horses or oxen on a prepared towpath. The canal ran along this site in Moraine from West Carrollton to Carillon Park. 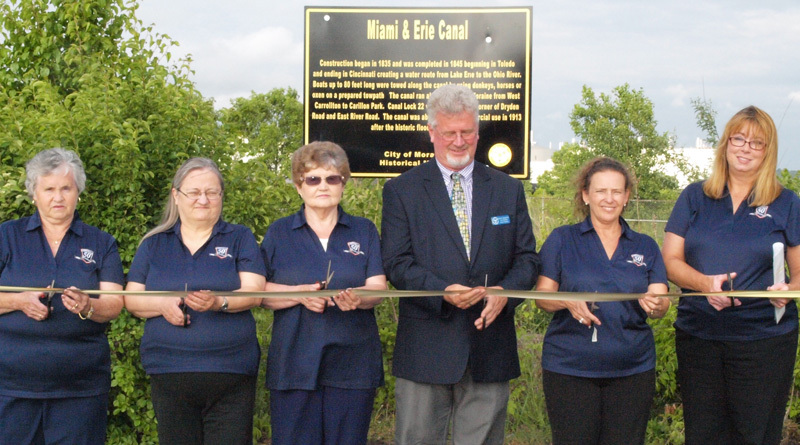 Canal Lock 22 was located at the corner of Dryden Road and East River Road. The canal was abandoned for commercial use in 1913 after the historic flood damaged it. As part of the newly formed Moraine Development Company owned by Adam Schantz, Colonel Edward Deeds and Charles Kettering, the Dayton-Wright Airplane Factory was completed in 1917. Much experimental work in the history of flight was performed in Moraine. Together with Orville Wright and H.E. Talbot the Delco-Light building was used to manufacture the country’s first bomber: the DeHavilland DH-4. Of 4,846 planes built in the US, 3,106 were built in Moraine for use in World War I. After the war, this building was taken over for use by Frigidaire Division of General Motors. In 1917 fourteen residences were built on Edison Avenue (now Blanchard Avenue). Gas Lines were installed, the street paved and sidewalks, curbing and gutters provided. The houses were occupied by workers at Dayton-Wright Airplane Factory and adjourning factory buildings. The Blanchard houses appear to be Sears Roebuck and Company mail-order homes. These homes could be ordered from catalogs from 1908 to 1937 and were shipped pre-cut, numbered and blueprinted to fit together. The homes ranged from $65 to $2,500. Charles Kettering and Colonel Edward Deeds named the other street names in this neighborhood in honor of famous inventors Charles Steinmetz, Marchese Marconi and Robert Fulton. A quarter mile south at the inner bend of the Great Miami River was one of the world’s first seaplane bases. The Wright Brothers tested their hydro-aeroplanes in 1912 along this stretch of the river. May 2013 marked the 100th anniversary of the first public demonstration of the Wright Model C-H Hydro-aeroplane flown by Orville Wright and mechanic William Jacobs. The first church in Moraine was Zion Memorial United Church of Christ established in 1820. The first church was built of logs with a stone foundation. The cemetery also was started at this time. Between 1820 and 1826 the first ministers were circuit riders on horseback. The congregation erected a two story brick building dedicated in May 1860. In 1886 and again in May of 1933 the church survived tornado damage to the roof, steeple and structure.